Durga, a Bengali novel by Suparna, revolves around the birth, childhood and life of the eponymous protagonist, till her marriage. The novel commences at the backdrop of post-partition of India when the social, political and economic conditions were still unstable. A mother in her acute labour pain is portrayed right at the beginning of the story who gives birth to a baby girl, Durga. Durga happens to be her second child and she is loved by her grandmother and also by her father. Thus, begins the journey of Durga in this world where she matures quickly and learns to hide her emotions and feelings in front of everyone. 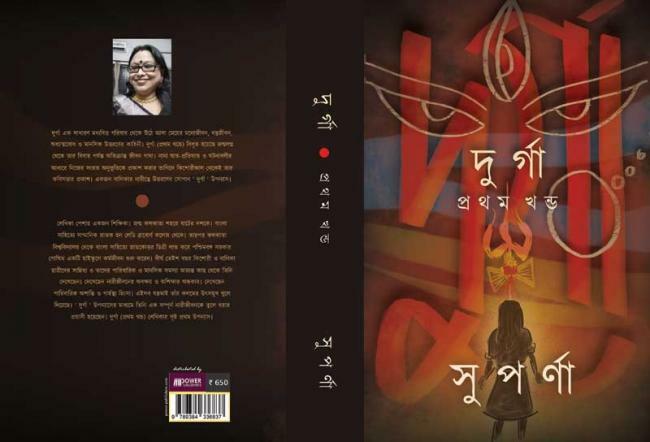 Author Suparna has highlighted details of Durga’s development, her childhood, adolescence and marriage and how she copes with every situation around her. Suparna’s flow of writing is admirable. Durga is a common woman with whom almost everyone can relate to but she is also blessed with some exceptional qualities. Life is filled with challenges but she never submits to any of those hurdles and finds out ways to overcome it with courage and mental strength. Most of the events in the novel will appear to be realistic since Durga is a part of every woman, she is present everywhere, her struggles are relatable and inspiring at the same time. The first part of the novel talks about Durga’s birth till her marriage with Kunal. At the end of the first part, Durga is aware of the fact that she is about to enter a new life as a wife in her in-law’s house and leave behind her father’s house and all her near and dear family members. The lucid style of writing will make it easier for the readers to understand and to know more about this brave woman, one must read Durga and get impressed.